Frederick Emmons Terman (/ˈtɜːrmən/; June 7, 1900 – December 19, 1982) was an American academician. He is widely credited (together with William Shockley) with being the father of Silicon Valley. Terman completed his undergraduate degree in chemistry and his master's degree in electrical engineering at Stanford University. His father Lewis Terman, a psychologist who studied gifted children and popularized the IQ test in America, was a professor at Stanford. Terman went on to earn an ScD in electrical engineering from Massachusetts Institute of Technology in 1924. His advisor at MIT was Vannevar Bush, who first proposed what became the National Science Foundation. Terman returned to Stanford in 1925 as a member of the engineering faculty. From 1925 to 1941 Terman designed a course of study and research in electronics at Stanford that focused on work with vacuum tubes, circuits, and instrumentation. He hired Charles Litton and Karl Spangenberg, a student of William Littell Everitt. Together they established a vacuum tube laboratory. He also wrote Radio Engineering (first edition in 1932; second edition, much improved, in 1937; third edition in 1947 with added coverage of new technologies developed during World War II; fourth edition in 1955 with a new title, Electronic and Radio Engineering), one of the most important books on electrical and radio engineering, and to this day a good reference on those subjects. Terman's students at Stanford included Oswald Garrison Villard, Jr., Russell and Sigurd Varian, William Hewlett, and David Packard. He encouraged his students to form their own companies and personally invested in many of them, resulting in firms such as Litton Industries, Varian Associates, and Hewlett-Packard. Terman was president of the Institute of Radio Engineers in 1941. During World War II, Terman directed a staff of more than 850 at the Radio Research Laboratory at Harvard University. This organization was the source of Allied jammers to block enemy radar, tunable receivers to detect radar signals, and aluminum strips (“chaff”) to produce spurious reflections on enemy radar receivers. These countermeasures significantly reduced the effectiveness of radar-directed anti-aircraft fire. After the war Terman returned to Stanford and was appointed dean of the School of Engineering. In 1945 he was influential in the creation of a microwave research laboratory at the Stanford School of Physical Sciences. In 1951 he spearheaded the creation of Stanford Industrial Park (now Stanford Research Park), whereby the University leased portions of its land to high-tech firms. Companies such as Varian Associates, Hewlett-Packard, Eastman Kodak, General Electric, and Lockheed Corporation moved into Stanford Industrial Park and made the mid-Peninsula area into a hotbed of innovation which eventually became known as Silicon Valley. 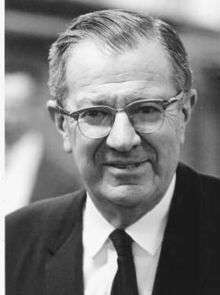 He served as Provost at Stanford from 1955 to 1965. During his tenure, Terman greatly expanded the science, statistics and engineering departments in order to win more research grants from the Department of Defense. These grants, in addition to the funds that the patented research generated, helped to catapult Stanford into the ranks of the world's first class educational institutions, as well as spurring the growth of Silicon Valley. Terman's efforts to create a mutual relationship between Stanford and the tech companies in the surrounding area also significantly contributed to this growth. In 1964, Terman became a founding member of the National Academy of Engineering. In 1966 Terman played a central role in helping the Park Chung-hee Administration establish the Korea Advanced Institute of Science, which later became KAIST. "When we set out to create a community of technical scholars in Silicon Valley, there wasn't much here and the rest of the world looked awfully big. Now a lot of the rest of the world is here"
He was awarded the IRE Medal of Honor in 1950 for "his many contributions to the radio and electronic industry as teacher, author, scientist and administrator". The Frederick Emmons Terman Award was established in 1969 by the American Society for Engineering Education, Electrical and Computer Engineering Division. It is sponsored by Hewlett-Packard and is bestowed annually upon an outstanding young electrical engineering educator. The Frederick Emmons Terman Engineering Scholastic Award is presented to the students that rank academically in the top five percent of the graduating senior class from the Stanford University School of Engineering. Stanford's Frederick Emmons Terman Engineering Center (1977-2011) was named in his honor. Terman Middle School, in Palo Alto, California and the adjacent Terman Park are named after Terman and his father. Terman, following his 'Terman Report' for the purpose of helping found what later became KAIST, is the eponym of Terman Hall. A section of US 101 is officially known as the Fredrick E. Terman Memorial Highway. ↑ "Biography revisits Fred Terman's roles in engineering, Stanford, Silicon Valley". Stanford Report. Retrieved 3 June 2016. ↑ "Lewis Terman (1877–1956)". Stateuniversity.com. Retrieved 3 June 2016. 1 2 Issues in Cyberspace: From Privacy to Piracy. Britannica Educational Publishing. 1 November 2011. p. 5. ISBN 978-1-61530-738-8. 1 2 Gillmor, C. Stewart (2004). Fred Terman at Stanford: Building a Discipline, a University, and Silicon Valley. Stanford University Press. p. 558. ISBN 978-0-8047-4914-5. ↑ Christophe Lécuyer (August 24, 2007). Making Silicon Valley: Innovation and the Growth of High Tech, 1930-1970 (trade paperback)|format= requires |url= (help). The MIT Press. pp. 49, 50. ISBN 978-0262622110. ↑ Gillmor, C. Stewart. Fred Terman at Stanford: Building a Discipline, a University, and Silicon Valley. Stanford, CA: Stanford UP, 2004. Print. ↑ Leslie, Stuart W., and Robert H. Kargon. "Selling Silicon Valley: Frederick Terman's Model for Regional Advantage." Business History Review 70.04 (1996): 435-72. Print. ↑ "Frederick Terman". IEEE Global History Network. IEEE. Retrieved 9 August 2011. ↑ National Academy of Sciences (20 January 2007). Biographical Memoirs. National Academies Press. p. 117. ISBN 978-0-309-10389-3. ↑ Fallis, George (2007). Multiversities, Ideas and Democracy. University of Toronto Press. p. 272. ISBN 978-0-8020-9240-3. ↑ Chodorow, Marvin (September 1983). "Obituary: Frederick E. Terman". Physics Today. 36 (9): 90–91. doi:10.1063/1.2915869. ↑ Lécuyer, Christophe. Making Silicon Valley: Innovation and the Growth of High Tech, 1930-1970.Cambridge, MA: MIT, 2006. Print. ↑ "KAIST's history and vision". KAIST.edu. KAIST. Retrieved 11 July 2013. ↑ "Professional and Technical Division Awards". American Society for Engineering Education. Retrieved November 3, 2010. ↑ "Past Frederick Emmons Terman Award Winners". American Society for Engineering Education. Retrieved November 3, 2010. Gillmore, C. Stewart (2004). Fred Terman at Stanford: Building a Discipline, a University, and Silicon Valley. Stanford University Press. ISBN 0-8047-4914-0.